IMdb description: When a friend of Charlie's is found kicked to death by his own race horse on board a Honolulu-bound liner, the detective discovers foul play and uncovers an international gambling ring. IMBd description: An honest bank employee gets hooked on horse racing, and starts to embezzle bank funds in an attempt to recoup his losses. Watch for Barbara Billingsley (The mom on Leave It To Beaver, who appears in the credits missing the "g" in her last name) and Carl Switzer, who was Alfalfa in the original Little Rascals series. IMBd description: A washed-up jockey gets his wish while waiting for the results of his race fixing hearing. IMBd description: Four losers borrow money from gangsters to bet on a "sure thing", but lose. The gangsters go after them to get their money. This one teams up Harvey Korman and Tim Conway. 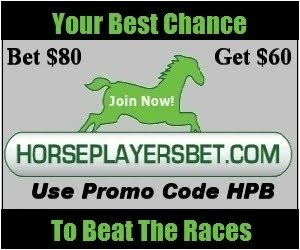 Don't forget to check out the latest Horseplayer Monthly, lots of useful handicapping information and much more. And it is free! And if you haven't done so already, join HANA (free to join). Why join and why use your real name? "Please understand something: At some point we are going to sit down at the table with track management and horsemen's groups and negotiate on your behalf. If nothing else we plan on making them painfully aware how their antics are hurting the game and alienating the customer. Having the names of real people in our member database serves two purposes. First, it gives us a way to keep you updated with our goals and progress towards those goals. Second, when we do sit down to negotiate, having real names puts us in a much better bargaining position than if we had a list composed of people's internet handles only." It seems that one of horse racing's largest entities has given up on the idea of pari-mutuel growth in North America. It is probably realistic given the direction the industry leaders are heading, especially when it comes to the effects of their actions on price sensitive players (the 25% of Horseplayers who wager more than 75% of the collective handle). It is a good thing that there is an acknowledgement that handle can be increased if foreign markets start participating in North American pools. But what is overlooked is that there are quite a few markets in the USA that doesn't allow parimutuel wagering. Why not push for those markets? One would expect that states that don't allow parimutuel wagering and/or online horse race wagering like Alaska, Georgia, Hawaii, Mississippi, Missouri, Nevada, North Carolina, South Carolina, Utah, DC, and Texas would have more interest in the North American racing product than countries in South America, for example. Texas has 9% of the US population, and internet horse race wagering is somehow banned there. It is unclear who is to blame for the law, but it needs to change. There is a coalition in Georgia looking to bring horse racing to the state, including online wagering, and they believe that they can add over half a billion in handle the very first year they get the green light. What is really mind boggling is that you can wager on play Daily Fantasy Sports online in every state mentioned above. Currently, it appears that Arizona, Iowa, Louisiana, Montana and Washington are taboo states for DFS companies. By the way, Arizona just started allowing phone betting on horses, so it is the only state with a consistent no "playing" online rule. Seriously, what is wrong with this picture? Not that most gamblers, especially young ones, in states like North Carolina would choose a 21% takeout game over an 8% takeout game if given the opportunity, the problem is they don't even have the choice to bet on horses. Still, expanding into states and/or countries is only a band aid solution in the big scheme of thing, and until pricing is dealt with directly, horse racing will continue to spin its wheels at best. The similarities between handicapping a few races and handicapping a fantasy basketball lineup are shockingly similar (so much for horse racing's learning curve excuse). The similarity ends when it comes to discussing industry growth as the North American horse racing industry has all but thrown in the towel (they know their current philosophies will mean no handle growth), while the Daily Fantasy Sports industry is thinking a bad year would mean it grows by less than 50% in 2015. Horse racing needs a few Jake Sanders in order to grow, but with a 21% average takeout, that is an impossibility.